We have very few children coming to our wedding so we wanted to do something special for them. In total we will only have 4 kiddos attending the reception. Two of them will be our flower girls who will be 5 and 7 and then two little male cousin's of FI's who will each be 2. 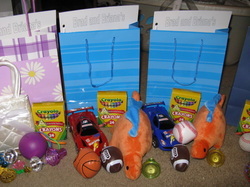 Each boy will get - a soft dino stuff animal, large toy car, 2 soft sports balls and maybe a few little things out of the assortment bag. 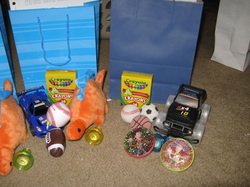 Each girl will get - a little purse and necklace, bounce ball, magnadoodle, and then little things from the assortment bag. We are also going custom coloring books and crayons. The coloring book template is attached below. You must have publisher to open it. 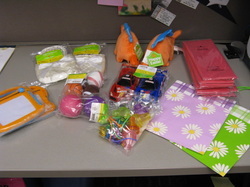 I was able to purchased Easter basket filler items at Wal-Mart the day after Easter for 50% off. 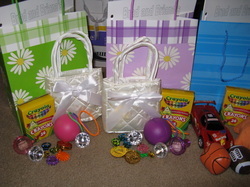 I also purchased two little flower gifts bags that I will use for the girls activity bags and I will get something boy-ish for the two little men. More pictures to come once we have the bags created! After Easter score! 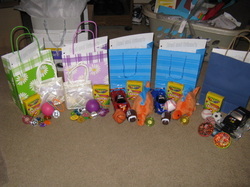 Once the items are removed from the plastic bags or little tags removed they will never know it was Easter stuff! 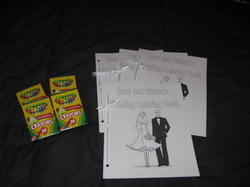 The coloring books are printed on a light cardstock and I used a small piece of ribbon to tie them together. I purchased thr crayons during the back to school sale for 25 cents each. I love a deal! 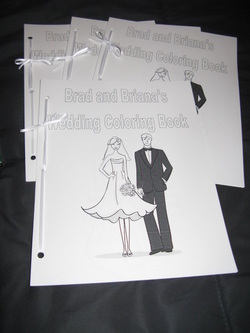 The original coloring book was made in Publisher. I have uploaded it as a PDF, however, because I know some people won't have Publisher. I have also uploaded all the images in a Word doc as well so that everyone can access. They are so cute I wish we had more than 4 kiddos coming to the wedding! We had an extra little one added after I did my after Easter shopping . . 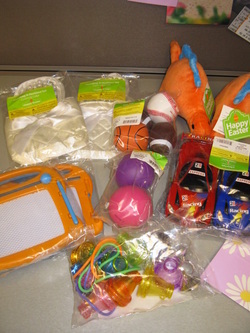 I found little items for him at the Dollar Store.